Over on his YouTube channel SignalsEverywhere, Corrosive has uploaded a new video tutorial showing us how to transmit with a PlutoSDR and SDRAngel. His tutorial goes over the initial set up steps, selecting a modulator and changing modulator settings. He then goes on to demonstrate transmitting CW Morse code, using a CTCSS squelch tone and transmitting a Robot36 SSTV image via Virtual Audio Cable and MMSSTV. Over on the YouTube channel Tech Minds the presenter has uploaded two new RTL-SDR based tutorial videos. The first video gives a bit of background and shows how to decode Morse code with an RTL-SDR. He uses SDR-Console V3 and the Morse code decoder CwGet. With this he's able to decode a few calls from some ham radio operators. In the second video Tech Minds shows how to decode Weather Fax with the RTL-SDR. Weather faxes are images of weather charts sent over HF frequencies. In the video he uses SDR-Console and SeaTTY to do the decoding and demonstrates reception of an example fax. Over on YouTube user Mile Kokotov has uploaded a video showing him receiving a WPX CQ CW (morse code) contest on his SDRplay RSP. The SDRplay RSP is a $149 USD software defined radio with a tuning range of 0.1 – 2000 MHz, 8 MHz maximum bandwidth and 12-bit ADC. In the video Mile shows that the SDRplay is capable of receiving many strong closely spaced CW signals at the same time as weaker ones without overloading. He uses the HDSDR software and a large 43.1m long delta loop antenna strung up in his backyard. Tim Havens is an avid CW operator on the ham bands and primarily uses his Yaesu FTDX-5000 transceiver for this purpose. At the same time he also uses a software defined radio coupled with an upconverter as a panadapter by connecting the SDR to the 9 MHz IF output of the Yaesu. 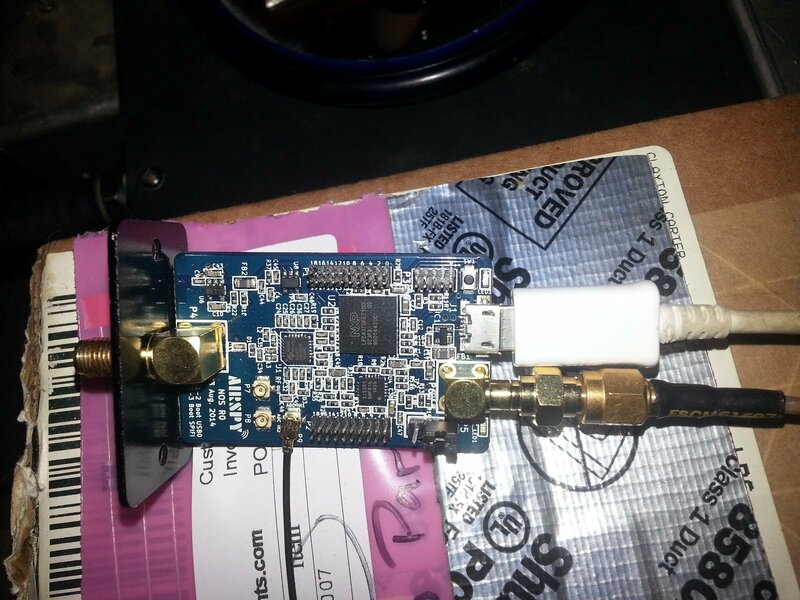 However a problem Tim encountered was that the frequency drift of any SDR he tried was too large, even with a TCXO based software defined radio (like a modded RTL-SDR or the Airspy), and that it was a constant hassle to recalibrate. Furthermore, he noticed that the upconverters he used introduced their own drift which just added to the overall frequency drift. 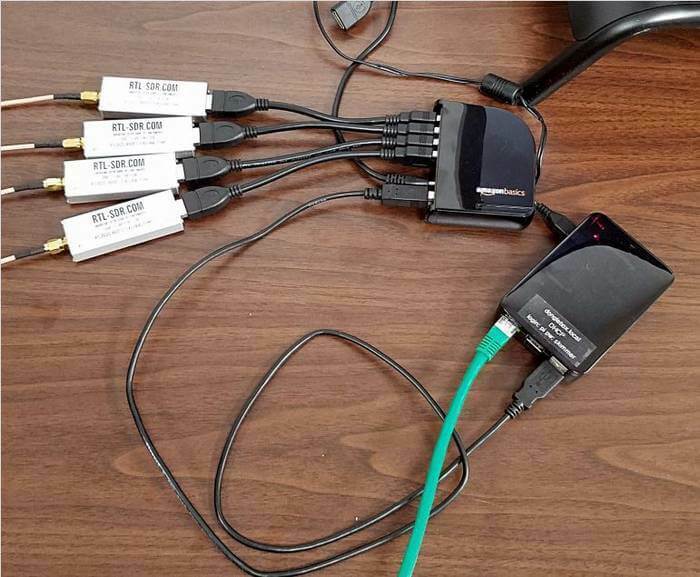 To get around this Tim decided to use the Airspy in a special configuration. First he used the external clock input of the Airspy to connect to his Jackson Labs “Fury” GPSDO. This device uses GPS satellites to generate a very accurate 10 MHz clock, with almost zero drift. Secondly, to get around the need for an upconverter with it’s own frequency drift he used the ADC1 direct sampling input ports on the Airspy to connect to the 9MHz IF output of his FTDX-5000 through an extra band pass filter and LNA. Tim writes that he will soon update his post with more images and a video. Airspy with external GPS clock and ADC1 output connected. Over on YouTube user Brent Crier has uploaded a tutorial video showing how to set up CWSkimmer with an RTL-SDR and HDSDR. CWSkimmer is regarded as one of the best pieces of software that can be used to decode CW a.k.a Morse code. Morse code is a communications technique still used widely by the amateur radio community in the HF bands. The RTL-SDR can receive HF frequencies and Morse code with an upconverter or direct sampling modification. In the video Brent goes over the installation of HDSDR, Virtual Audio Cable, and a program called Virtual Serial Port (VSP) manager as well as the needed settings for each program. The set up he shows allows CWSkimmer to automatically change the frequency in HDSDR when tuning in CWSkimmer. On the FUNcube Dongle blog/store amateur radio enthusiast DK80K (a.k.a Nils) has sent in a link to a 16 page pdf file showing a comprehensive tour on the FUNcube Dongle Pro+’s capabilities on the HF spectrum. He gives an overview of many digital ham and HF utility modes including DRM, WSPR, RTTY, Olivia, MFSK16, PSK31, Pactor, Packet, Hellschreiben, ROS, SSTV, HF ACARS, SSB, CW, DSC/GMDSS, SITOR-A/B, Globe Wireless, Time Signals, ALE, Baudot, FAX and Stanag 4285. The FUNcube is a software defined radio similar to the RTL-SDR, but with better sensitivity and noise performance, but at a higher price (around $200 USD). These modes can also be received with the RTL-SDR and an upconverter such as the Nooelec Ham-It-Up upconverter.